If you want to fight depression or boost creativity, all you need is brain stimulation treatment, according to the first results of a placebo-controlled study conducted in North Carolina. Scientists at the University of North Carolina at Chapel Hill proved that normal treatment of psychiatric diseases, involving alteration of electrical activity in the brain, can measurably boost creativity. The results were published in the journal Cortex under the title “Functional role of frontal alpha oscillations in creativity”. Twenty healthy individuals, between the ages of 19 and 30, participated in the study, undergoing a low dose of electric currents (a safe and non-invasive frequency of 8 to 12 hertz cycles per second) the first time for five minutes, and then for thirty. 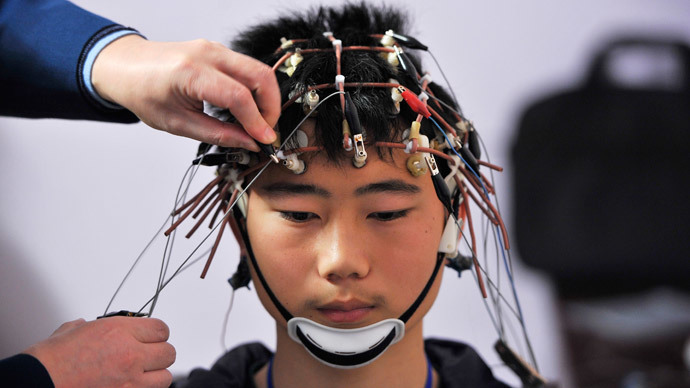 Electrodes attached to their scalps showed prominent rhythmic EEG patterns. The results, in a “common, well-validated” test of creative thinking, improved by on average 7.4 percent, during the second period of treatment. “That’s a pretty big difference when it comes to creativity,” said senior author Flavio Frohlich in the press release. To test the accuracy of the research, a second experiment was held – this time, with 40 Hertz of electrical current. This involves gamma frequencies typically associated with conscious perception of senses. According to previous research, highly creative people demonstrate alpha activity, which is characteristic of a restful waking state of mind, such as in daydreaming. That is why alpha waves in the brain, discovered in 1929, may be essential for the creative process. “This study is a proof-of-concept. We’ve provided the first evidence that specifically enhancing alpha oscillations is a causal trigger of a specific and complex behavior – in this case, creativity,” Frohlich said. “But our goal is to use this approach to help people with neurological and psychiatric illnesses. For instance, there is strong evidence that people with depression have impaired alpha oscillations. If we could enhance these brain activity patterns, then we could potentially help many people,” Frohlich added. So, the team has started clinical trials to examine major depressive and premenstrual disorders. They believe that people suffering from such disorders could also benefit from alpha wave brain stimulation. “If people with depression are stuck in a thought pattern and fail to appropriately engage with reality, then we think it’s possible that enhancing alpha oscillations could be a meaningful, noninvasive, and inexpensive treatment for them – similar to how it enhanced creativity in healthy participants,” Frohlich said. However, stimulating alpha waves in the brain may not necessarily mean resorting to electric shock therapy. Meditation is an easier way to increase alpha activity, according to a 2010 Norwegian study.